Watch this topic for replies to be notified when this guide is updated (register and log in first) or sign up for our newsletter. Please do not reproduce, copy, or create PDF or DOC versions of this guide. Instead, we ask that you simply link to this page and let the reader print it out themselves. This ensures that everyone has the most up to date version. All content (c) copyright 2013-2017 CurtPalme.com. Is this guide for me? This guide is for the home theater enthusiast who wants to get the absolute best picture out of any TV or projector. It will show you how to obtain the most accurate colors possible on any display regardless of what sort of technology it uses (Plasma, LCD/LED, DLP, SXRD, LCOS, CRT, etc.). It doesn't matter if it's a 20 year old analog display or the most recent 4K projector or TV. They will all benefit from calibration. No prior knowledge or understanding of calibration is required. We explain what it is, why it's important, list the tools needed, where to get them, and walk you through the process from start to finish. Read on and learn why proper calibration is regarded as one of (if not the) most important actions that should be performed on all TVs or projectors for optimal picture quality. How is this guide different from the previous calibration guide? Our previous calibration guide was written in 2008 and focused primarily on the calibration of CRT projectors. While this new version of the guide will work with any display technology, it focuses on the calibration of newer display technologies such as digital projectors and flat panel TVs as it includes information on the finer controls offered by these newer display devices, especially in the areas of gamma and color calibration. Easier to use and more intuitive, with a built-in workflow. Advanced grayscale, gamma, and color calibration tools. Comprehensive reporting tools (the previous software did not include reporting features). Excellent built-in help: You may click the Help button on any screen for detailed information, hints, and instructions and steps that are specific to the module you're working in. Technical support: ChromaPure is a commercial product that is continuously updated and comes with lifetime support. Greater support of meters, including newer professional quality colorimeters and spectroradiometers and increased accuracy on 10+ specific display types. Support for signal generators including 3D signals from AccuPel signal generators. Ability to perform completely automated calibration when used in conjunction with a video processor such as the Lumagen Radiance, including color calibration of up to 4913 points (instead of only 6) for greatly increased accuracy. Automated calibration allows anyone with little or no training to fully calibrate their display with almost no user input. Just setup a few simple options, click Auto-Calibrate, and then just go have a cup of coffee while the process completes. In less than 10 minutes your display will be full calibrated to professional standards. The package of tools does all the work for you and this guide is not needed. For years we've been saying that a guide for ChromaPure is not required as it is already easy to use, intuitive, and includes a built-in workflow to assist new users. That said, everyone works differently and some prefer a written guide. We hope that you find it useful. If you've spent $1,000 or more on a TV or projector, chances are you're serious about home theater. What many people don't know about projectors and TVs in general is that they require calibration in order to produce a close to accurate representation of the video signal being displayed. One of the most effective ways to get a theater-like picture is to have the display professionally calibrated. The most important aspects of professional calibration (and the ones that require special gear) are grayscale, gamma, and color calibration. These are the topics we cover in this guide. The main downside to professional calibration is the price: It typically runs anywhere from $350-$450 for a simple TV to more than $1,000 for a complex home theater setup. Worth every penny of course but not inexpensive! Another downside is that for optimal results calibration must be performed as equipment is changed, as components age, and in the case of digital projectors, as the bulb ages. The colors displayed by digital projectors tends to change dramatically over the 1,000 - 5,000 hour lifespan of the bulb. It is not uncommon for a videophile with a digital projector to calibrate their display every 100 - 200 hours (especially when the bulb is new). The good news is that in the last few years calibration has become affordable for the average do-it-yourself home theater enthusiast as the equipment prices have come down drastically and quality has improved greatly. Someone looking to calibrate their display can now do it themselves with very good results for minimal investment. This guide will walk you through the steps required to perform this calibration with the assumption that you know absolutely nothing about calibration to begin with. Not only is it easy to do, doing it yourself is very rewarding and a learning experience! We'll start with calibration of the display's levels (brightness/contrast), as it's the most critical and easy to accomplish step, then grayscale calibration, and then move on to gamma calibration, and then finish with color calibration. While it is not essential that the user understand the inner workings of these calibration steps, below is some additional information for those that may be curious. If not interested, skip down to the What tools do I need? section and get started. What is video levels calibration? The first and most essential step in video calibration is setting the levels properly. These are the white and black levels. White level is adjusted with the contrast control and black level is adjusted with the brightness control. 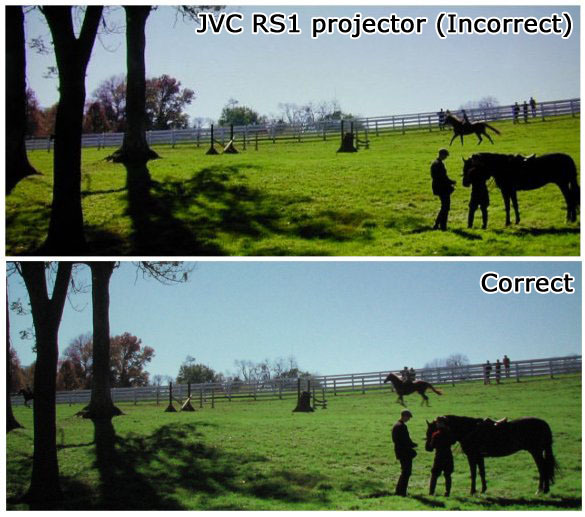 This is one aspect of video calibration that must be done by eye. When both white level (contrast) and black level (brightness) are set properly, the display will reproduce very bright, intense scenes with full detail and very dark images with excellent shadow detail. Performing grayscale calibration is the act of adjusting your display to make sure that from near black (10% video) to white (100% video) the display shows as close to the correct shade of gray as possible without the intrusion of unwanted colors. Gray cannot be slightly reddish, bluish, or greenish. This is done with the aid of a color measuring meter or colorimeter. A colorimeter must be used as our eyes are a horrible tool for measuring colors. Gamma is a term that describes the relationship between the signal input from the source device and the signal output of your display. This is not a one-to-one relationship. Gamma is expressed as a number, generally between 1.5 and 2.5. As you can see from the graph above, various gammas all begin and end with a one-to-one relationship between signal input and light output where 0% input produces 0% output and 100% input produces 100% output. This is as you would expect. However, everything in between the precise relationship between input and output is not linear, and the precise nature of this "gamma curve" varies depending on the gamma itself. A display with lower gamma increases its light output more quickly as you increase the signal input. If you look at the 10% input, you will see that a 2.8 gamma produces only 20% of the light output of 2.1 gamma. This is obviously an enormous difference. The difference becomes increasingly less significant as the level of input rises, so that at 80% input a display with a 2.8 gamma produces nearly 86% of the output of a display with 2.1 gamma, which would be barely noticeable. Another effect of gamma is the perceived depth of the image. Even a regular 2D TV simulates three-dimensional space. A display whose gamma is too low will produce images that tend to be flat, lacking in depth. This is a common problem, because display manufacturers will often engineer their products to have a higher-than-normal gamma to increase overall light output. 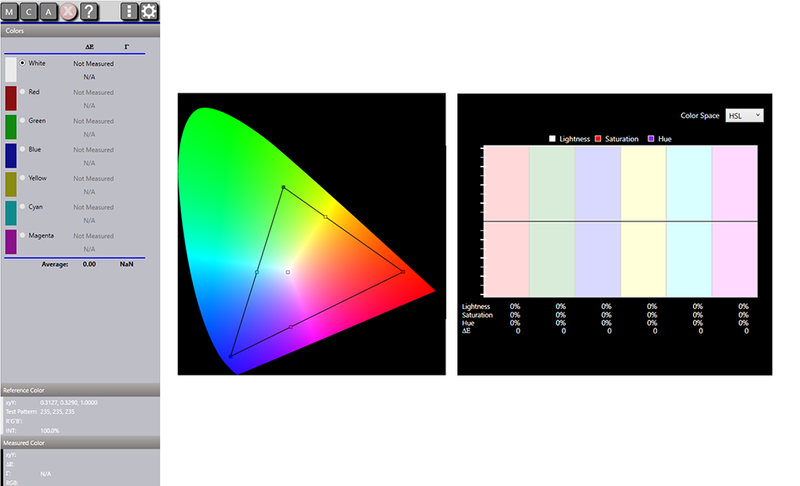 Color calibration is the final step in display calibration. Color calibration ensures that the palette of colors (the raw colors) used by the display are all reproduced accurately, as they were intended by the content creators. Proper color calibration has the grayscale as its foundation. Accurate colors are not possible unless the grayscale is accurate first. If we compare this to painting with a brush, grayscale calibration ensures that the proper amounts of paint are mixed together to get the colors we need, while color calibration is ensuring that we have the right base colors to mix in the first place. For example: If your bucket of red paint isn't perfectly "pure" red, no matter how you mix in the other primary colors you'll never you'll never be able to get that red any more correct. Why should I calibrate grayscale, gamma, and color? Calibrating grayscale, gamma, and colors will greatly improve your display's ability to not only produce black and white accurately but every other color in between. It will also improve the contrast and allows your display to operate closer to its optimal levels thus prolonging its operating life. Without proper calibration the image quality will suffer, resulting in inaccurate colors, poor shadow detail (loss of darker details), reduced contrast, and lack of image 'punch'. The picture will simply not be very engaging or lifelike. Movies are created and meant to be displayed at D65 color temperature, so if your TV is calibrated properly to D65, you are that much closer to seeing what the content creators intended. A common misconception is that you can achieve proper grayscale and colors by using the standard display controls such as hue, color, and contrast. This is not correct. These controls do not affect grayscale or color in the ways we want. To do grayscale calibration you need to adjust the amount of red, green, blue at each level of intensity from just-above-black to 100% white. To adjust the colors themselves you need to go into further adjustments of the 'pure' colors. Most advanced TVs and projectors have menus where grayscale controls are offered. Some also have controls for adjusting the colors. These are the controls that we will be adjusting with the help of a meter and ChromaPure software using this guide. Some people will try and claim to do accurate grayscale and color calibration by eye but the human eye is actually a very poor tool for measuring light output or colors. The results will be far from ideal. Someone who's been using a meter may get pretty good at doing it by eye after many years of practice, but then they've had years of experience with a meter. A bit of a catch-22 as if you already have a meter, why not keep using it? Why is calibration needed at all? Why isn't my TV perfectly calibrated at the factory by the manufacturer? Why is this something I have to do myself or pay someone to do? Unfortunately manufacturers do not seem interested in making sure their displays conform to the agreed upon and accepted color standards used by television broadcasting and movie studios. In fact, they do quite the opposite and on purpose! In an attempt to sell more TVs, manufacturers are constantly trying to come up with "brighter blues" and "more vivid reds" than their competition. Similar to how laundry detergent manufacturers add blue dye to their soap to make whites "whiter", TV manufacturers are pushing colors to make their TVs seem more enticing to the buyer on the showroom floor full of different brands. How's a consumer to decide which TV to buy when faced with a wall of seemingly similar displays? Why, you pick the brightest one, or the one with the most vivid colors of course. Right? Wrong! What you, the consumer, need to understand is that there is only ONE correct way to display colors: By following the industry wide recognized color standards used for standard definition (SD) and high definition (HD). Everything else is simply wrong. Movies and TV shows are all meticulously created to adhere to these industry color standards that have existed for years. For a TV or projector to reproduce what the director intends the audience to see, it has to follow these standards. No matter what the sales guys and manufacturers tell you, any TV that expands the color range to go outside the bounds of the accepted industry color standards is displaying incorrect colors! It is that simple. There are no tricks to this: The TV is either following the standards or it isn't. Remember this next time you go TV shopping. For more information on how manufacturers purposely screw up TVs and other displays to trick our brains into choosing their products, watch the first few chapters of the excellent Digital Video Essentials: HD Basics (Blu-ray) test disc. My TV has a 6500K or THX setting so I don't need grayscale calibration. I simply choose this option and I automatically have a perfectly calibrated TV. Right? Unfortunately, no. It's not that simple. Choosing the 6500K color temperature or THX option in the TV/projector setup menu is a step in the right direction and we thank the manufacturers that include this option. Unfortunately this option is rarely anywhere near accurate across the entire grayscale. It also does not take into account the rest of the equipment being used (including the screen), or the age/wear on the TV or bulb. Photos courtesy of forum member Clarence (seen lurking in the shadows of the first picture). Taken on his Sony G90. Thanks Clarence! Assuming the monitor you're currently using has a reasonably correct grayscale, the second screenshot should look a lot better than the first. 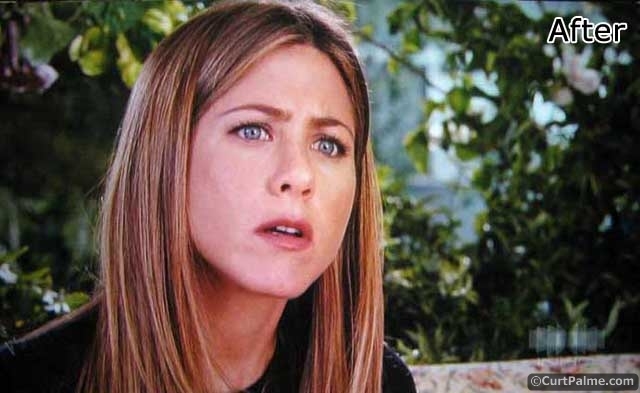 Notice how in the second shot Jennifer Aniston's face no longer has a red/blue tint and how the colors are more vibrant, the contrast better. The image simply has a lot more "pop" to it. With proper grayscale calibration the image has a lot more "punch" to it and will appear much more natural. The entire picture is also brighter, without even having changed the contrast setting! As mentioned previously, the Sony G90 is a professional grade projector with an original MSRP of $40,000 USD, but even it was far from perfect at the default factory settings for 6500K! Correct grayscale can only be truly appreciated when the before & after picture is seen in person, not by viewing screenshots as you lose a lot of the details with digital cameras and viewing through another display. You may find that your projector or TV looks fine today but until you've actually seen what it's really supposed to look like, you simply won't know how much you've been missing. You will quite literally think you're looking at a completely different display after you've completed your grayscale calibration. I don't have Blu-ray or high-definition. My TV/projector isn't 1080p capable. I just watch regular DVDs or regular TV. Is calibration still worth it? Proper video calibration has nothing to do with the latest technologies like high definition or Blu-ray. Regardless of image resolution used by your source devices (4K, 1080p Blu-ray/HDTV, 480i DVD or broadcast television) proper calibration will ensure that you are seeing the best possible image. While HD content shown through HDMI cabling will provide you the best image quality available today (and should be used whenever possible), standard definition content will still benefit greatly from proper grayscale & color calibration. Video calibration has been around since the dawn of television. It's not a new concept. It will also continue to be useful far into the future as new technologies and content are invented. Wherever there are movies and television, calibration will always be required. Interested in doing the grayscale and color calibration? Let's get to it! It's easier than you think! We recommend and sell ChromaPure software for this purpose at discounted prices. It is easy to use and quite powerful. Packages bundled with meters a test disc are also available. A meter is needed to measure light and color levels. See our FAQ: Which meter is right for me? for a comparison of the various popular models. For this guide we use the X-Rite i1 Display Pro (sometimes called the 'Display 3'). While ChromaPure supports many different meters, this is by far the best bang for the buck meter available today. An enhanced accuracy version called the Display 3 PRO is also available that provides increased accuracy on over 10 different display types. This is the version that we use ourselves to calibrate our personal home theater. You'll need a test disc with various patterns including 0% to 100% test patterns. A disc specifically made for ChromaPure will be used here. It's included for free with certain ChromaPure/meter packages. Our guide will show you exactly where to find the patterns needed using this disc. Other test discs such as Digital Video Essentials: HD Basics disc or Digital Video Essentials (standard DVD version) or Avia II will work too, but the disc menus are different so you'll have to find the patterns yourself. We do not recommend using the original Avia DVD as the grayscale patterns have proven to be incorrect. You'll need a tripod for holding the sensor in front of the screen for projector/screen based setups. This is not absolutely needed for direct-view or rear projection TVs because direct contact measurements are always an option. However, using a tripod is a good practice even for direct view displays. Make sure the tripod extends to at least the middle of your screen. Just about any tripod will work as the meters are small and light. The Display 3 meter comes with a built-in tripod mount. A laptop is preferred for portability, but just about any computer running Microsoft Windows 7/8/10 will do. Computer speed and storage capacity are not important. NOTE: A Mac will work too. Mac users can run PC software quite successfully using Parallels or Fusion. Purchasing through our links helps support our site at no extra cost to you. We thank you! Brightness: The control used to adjust black level. Setting brightness too low will cause darker details to be lost into black (called 'black crush'). Setting brightness too high will cause the black to appear gray. Brightness affects all colors at the same time. Contrast: The control used to adjust white level or peak light output. Setting contrast too low will sometimes result in a dim picture. 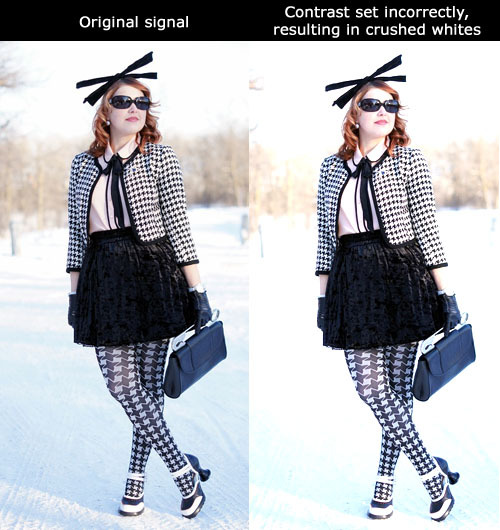 Contrast set too high can cause lighter details to be lost into white (called 'white clipping') or white crush. Contrast affects all colors at the same time. Color: All displays have a main Color control. Use this to adjust color if your display does not have a color management system. Hue (or Tint): All displays have a main Hue (or Tint) control. Use this to adjust color if your display does not have a color management system. Sharpness: All displays have a sharpness control. Only analog devices, such as CRT, really need this control, but digital devices have this control as well. Picture Mode: Most displays have a Picture mode. This is a global preset that selects a wide range of image parameters. It is extremely important to select the correct Picture mode. RGB LowEnd: The control used to adjust the amount of individual Red, Green, or Blue color in the darker end of the grayscale scale. Think of it as an individual brightness control for each color. Manufacturers all use a different name for this control though 'Cut', 'Cutoff' and 'Bias' are the most common terms used. We will refer to this control as 'RGB LowEnd' in this guide to avoid any confusion. 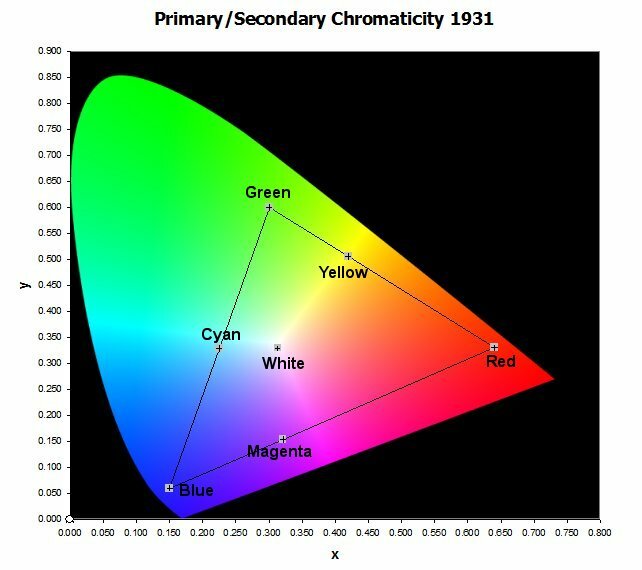 RGB HighEnd: The control used to adjust the amount of individual Red, Green, or Blue color in the lighter end of the black to white scale. Think of it as an individual contrast control for each color. Manufacturers all use a different name for this control though 'Drive' and 'Gain' are the most common terms used. We will refer to this control as 'RGB HighEnd' in this guide just to avoid any confusion. Gamma Preset or Gamma controls: Many displays do not have gamma presets, much less full 10-point gamma controls. However, they are invaluable for getting a good gamma curve from the display. 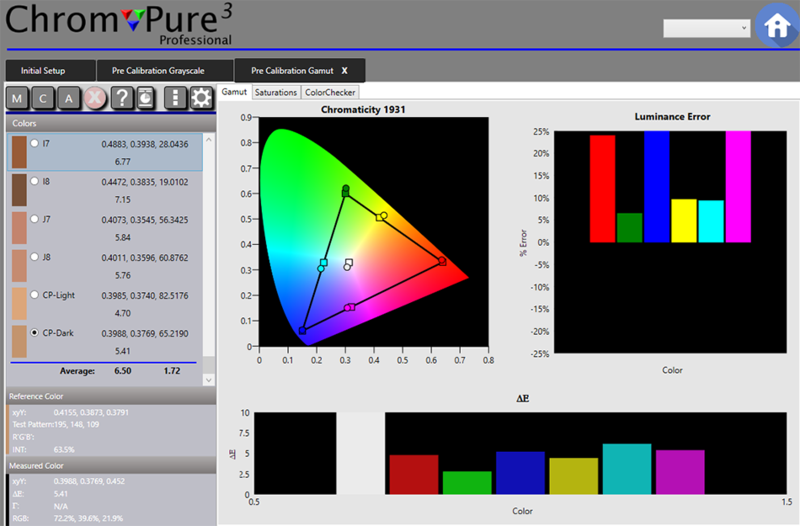 Color Management System: Increasingly popular with new displays, a full-featured color management system allows the users to adjust the primary and secondary colors along three axes—Hue, Saturation, and Luminance. All displays have brightness and contrast controls. If your projector or TV has RGB LowEnd and RGB HighEnd controls for Red, Green, and Blue, then you will also be able to calibrate your grayscale. Since different manufacturers use different names for the RGB LowEnd and RGB HighEnd controls, refer to your user manual and look for a section on "grayscale", "white balance", or "color temperature" adjustment to see what they're called for your display. That's it for the introduction. On to the calibration! TIP: The Basic Calibration test patterns on this disc include many extra tips and instructions for use. Simply press the Menu button on you Blu-ray player remote while viewing these test patterns for extra help. You will be required to manually select the test patterns needed for each stage of the calibration process. If you intend to use this disc (or a different DVD or Blu-ray), then no setup is needed and you may skip to STEP 1.2. If you wish to take advantage of ChromaPure's internal test pattern generation feature, this requires some initial setup. Anyone whose PC includes an HDMI output port may use this feature. NOTE: Brightness, contrast, and sharpness can only be adjusted by eye. Both the Calibration Disc and the Built-in Signal Generator have test patterns for this. NOTE: ChromaPure offers three user interfaces. Two of these offer a navigation bar down the left side and also across the bottom of the screen. However, the default UI is a full page tablet interface. We will be using this for the remainder of the guide. 1.1.3. In the Signal Generators section select ChromaPure Built-in Signal Generator. 1.1.4. Select the desired Pattern Size and Intensity. If you are calibrating a plasma, OLED, or CRT display, set Pattern Size to "Standard Windows". For all other display types, use "Fields". For Intensity 75% is generally recommended for colors and 100% for white. Color Format and Resolution are controlled by the PC's video card settings. 1.1.5. Plug-in an HDMI cable to the PC and connect to your display. 1.1.6. Use the Windows Extended Desktop feature to activate two simultaneous monitors. 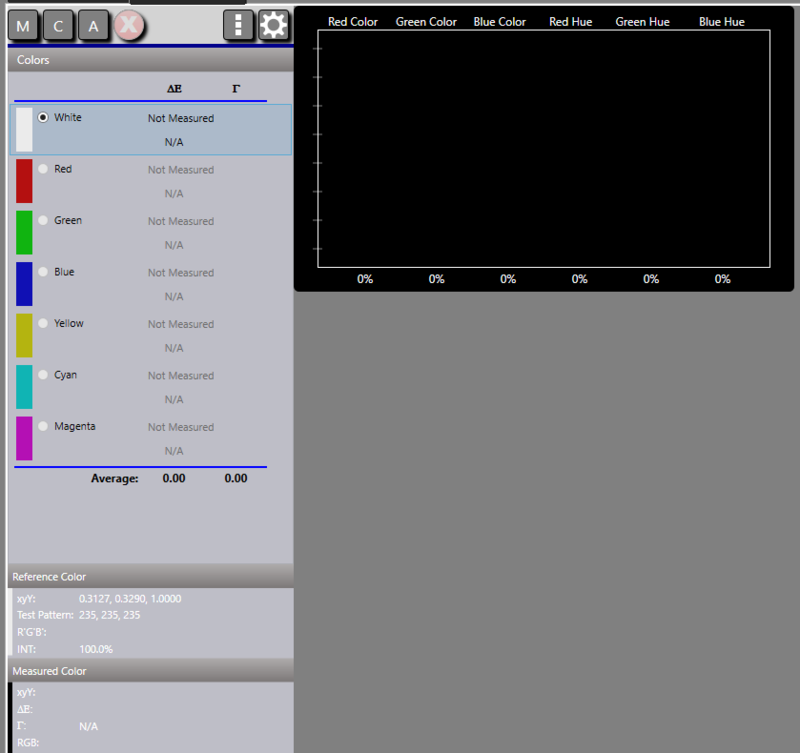 Your PC monitor will display ChromaPure, and the display you wish to calibrate will display the test patterns. Just drag the test pattern onto the main display, right-click and then select "Maximize". 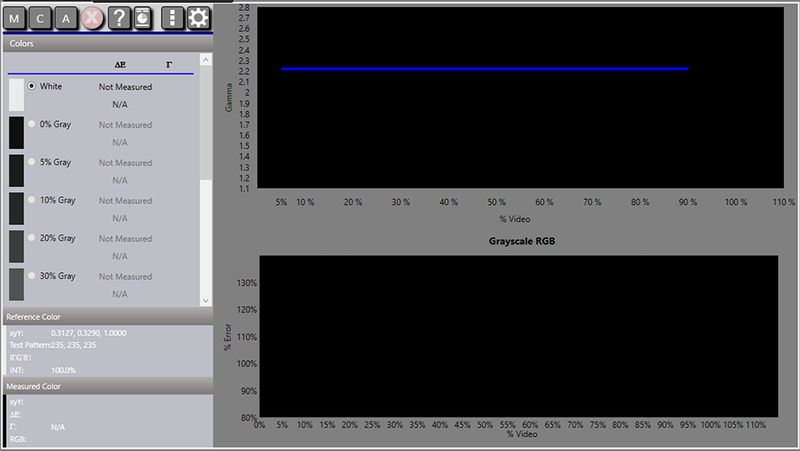 Selecting any color or grayscale level in ChromaPure will now automatically display the needed test pattern. Before you can do anything with video calibration software, you must initialize the meter, so it can take measurements and transmit the colorimetric data to the software. 1.2.1. You setup the meter on the same page from which the signal generator is configured, and we are already there from the previous step. 1.2.3. Select the meter from the drop-down list. 1.2.4. Select the desired mode of operation, and then click Connect. 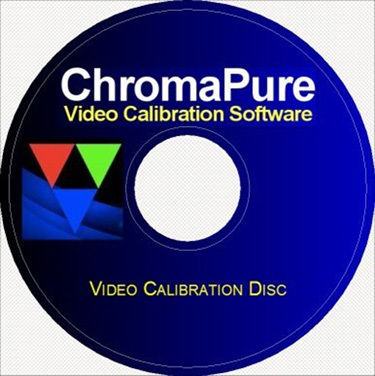 ChromaPure will do an initial communication check with the meter and a window will appear with the text "You are now ready to calibrate your display". Click Ok to close the window. Return to the main menu by clicking the X in the Initial Setup tab or by clicking the Home button in the top right of ChromaPure. - If you have a standard Display 3 meter (retail or OEM), then two operating modes will appear (Standard, Plasma, CRT, and Front Projection Lens). If you have a Display 3 PRO, then many more operating modes will appear, each of which has been individually calibrated for specific display types for greater accuracy including LCD and LED displays from Samsung, Sony, and LG - to name a few (complete list here). - If you have a newer Rev. B version of the Display 3 or Display 3 PRO meter an option for Scan Rate will also appear. The three choices are: 60 Hz, 50 Hz, and 24Hz. In North America use 60 Hz unless you know that your display is set to 24 Hz, in which case use 24 Hz. If unsure, use 60 Hz. For European systems use 50 Hz. Let the display warm up for about 30 minutes before beginning calibration. It will take time to stabilize. For front projector setups make your room as dark as possible and preferably pitch black (just like when you're watching a movie), making sure to not have any stray light hitting the screen. This includes the laptop or computer monitor as well. Point it away from the screen and turn the laptop or PC monitor's brightness down. For front projectors install the sensor on a tripod, point the sensor towards the center of the screen (with the sensor's diffuser out of the light path) set back a foot or two at a slight angle so it does not read its own shadow. For direct view displays other than plasma place the colorimeter on a tripod close to the screen (an inch or so - the distance isn't overly important). Depending on your meter, you may also hang it over the top such that it sits against the screen. Some meters have counterweights to make this easy. If you are calibrating a plasma display, it is a good practice to place the colorimeter on a tripod set back from the screen about a foot. This will minimize the effect on the sensor of the heat that comes off the plasma screen. It's also important to use the right test patterns for your display type. 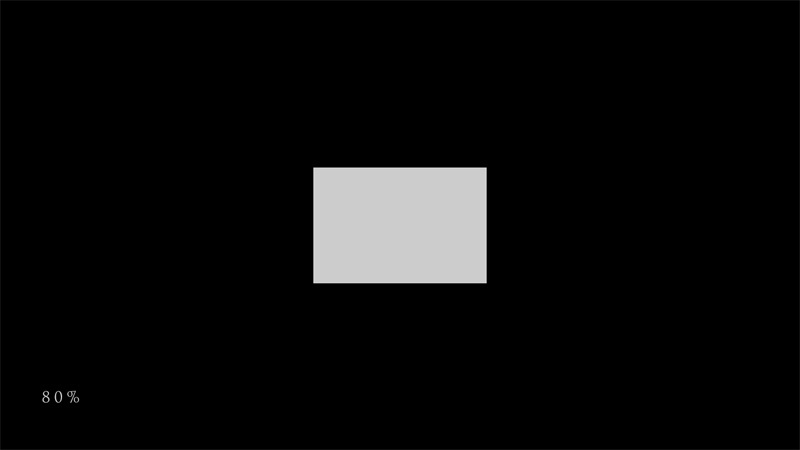 If you are calibrating a plasma, OLED, or CRT display, always use window test patterns for grayscale, gamma, and color calibration. Although not strictly necessary, taking pre-calibration measurements will give you some idea of how far our from industry standards your display is. It is also necessary if you wish to run a report at the end of the process showing pre and post-calibration performance. If you are using a signal generator, then you can click A to measure all of the colors in the module at once. If you are using a DVD or Blu-ray disc, then you should click M to measure and then advance the disc to the next test pattern before clicking M again. 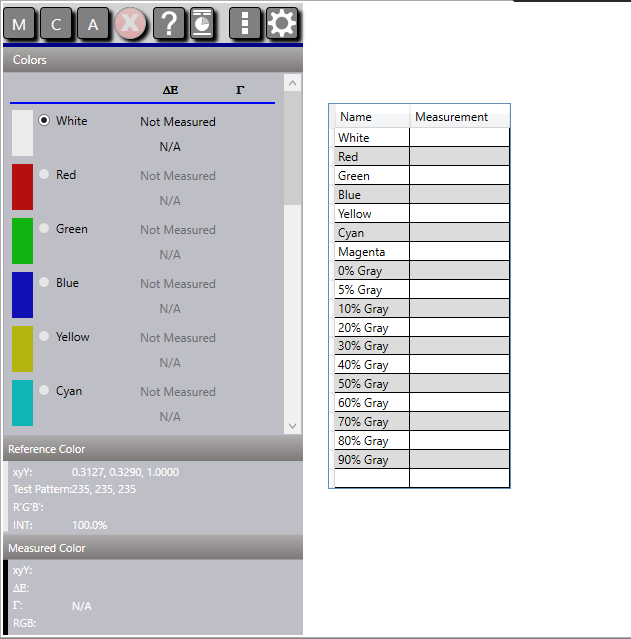 To take a customized set of measurements within a module, you can always just use the desired color and then use M for each measurement you wish to take. Also, if the measurements are contiguous (and you are using a signal generator), you can select the first in the list and then click A. NOTE: You must always measure a white reference before measuring any color in a module. There is a white reference for pre-calibration, calibration, and post-calibration, so if you have measured a white reference in one module, then it will transfer to all other modules in that category. 1.3.1. Return to the main ChromaPure window, and click the Grayscale icon under the Pre-Calibration heading. 1.3.2. Display the 100% white test pattern found on the ChromaPure Calibration Disc at: Main Menu -> Grayscale -> Full Field (or 6.5% Window) -> 100% Stimulus. If you are using ChromaPure's built-in test patterns, it will appear automatically. Position the sensor, and then click M (Measure). If you are using a signal generator, then you can click A (Measure All) and all of the grayscale levels will measure. Data will appear for the 100% level, including xyY, CIE94 (ΔE), and CCT (color temperature). Gamma and output data will appear only after all levels have been measured. You can ignore all of the data for 0%, except the Y value (luminance), which will be used to calculate contrast ratio. ChromaPure will automatically advance to the next level, ready for the next reading. NOTE: ΔE (or dE / deltaE) is an invaluable tool for video calibration. It is a measure of color error, so the smaller the ΔE of a measured color the better. ΔE can be used with both grayscale and color calibration. There are many ΔE formulas, and you can select the desired formula in the Options module. However, we feel that the default formula, CIE94, is the best for most calibration tasks. You can see from this example that the average ΔE (error) is 4.32 and the RGB values in the chart are not balanced. The goal of grayscale calibration is to balance these RGB values from 5%-100% as well as possible and get the average ΔE to 2.0 or less. 1.3.4. Return to the main ChromaPure window, and click the Color Gamut icon under the Pre-calibration heading. 1.3.5. Display the 100% white test pattern found on the ChromaPure Calibration Disc at: Main Menu -> Adv. Color Management -> Full Field Amp/100%S (or 6.5% Window Amp/100%S) -> White Sweep -> 100% White. Click M (Measure). Information for white will appear in the data grid above, a color point will appear on the CIE chart, and the color selector will advance to Red. 1.3.6. Display the 75% red test pattern found on the ChromaPure Calibration Disc at: Main Menu -> Adv. Color Management -> Full Field Amp/100%S (or 6.5% Window Amp/100%S) -> Red Sweep -> 75% Red. Click M (Measure). Information for red will appear in the data grid above, a color point will appear on the CIE chart, a bar will appear on the Luminance chart and on the ΔE chart, and the color selector will advance to Green. 1.3.7. Repeat the process until all of the primary and secondary colors have been measured (White, Red, Green, Blue, Yellow, Cyan, and Magenta). The Color gamut includes two sub-modules, Saturations and ColorChecker. If you choose to Measure All then these colors will be measured as well. Capturing these colors is important as a way of assessing how well your display performs under real-world conditions. If your display offers selectable Picture modes (most do), then it is very important that you select the correct one before beginning the calibration. Some Picture modes are so accurate that very little adjustment is required. Other Picture modes are truly awful and are so far out from the industry standard for display performance that the display cannot be fully calibrated in that mode at all. If you don't know, the best way to determine which is the best Picture mode is to run the Pre-Calibration Grayscale module for each mode. Select the Picture mode that offers the lowest average ΔE across the grayscale and a gamma closest to 2.22. To set black level correctly all you need is a good calibration DVD/Blu-ray. Setting white level, as we shall see, is a little more complicated. 2.2.1.2. Turn the display's brightness control on the display to its maximum. 2.2.1.3. 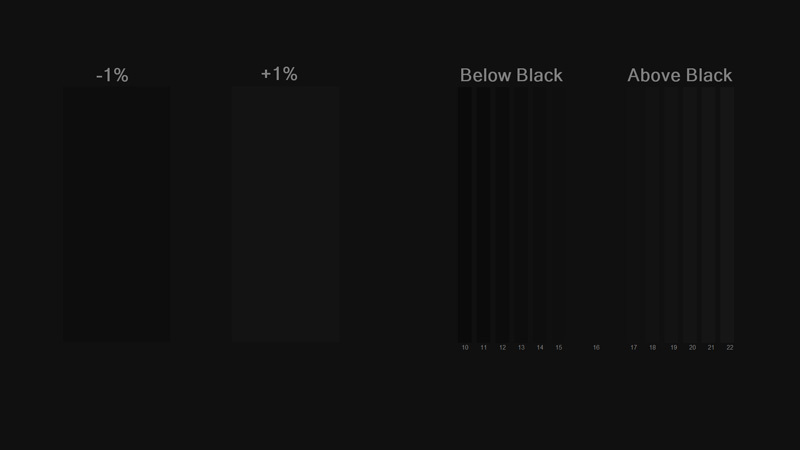 At this setting, all of the "Below Black" and "Above Black" bars will be visible. 2.2.2.2. With Contrast set to its mid-level setting, gradually raise the display's contrast level as high as you can as long as at least one of the "Above Video White" bars is still visible. 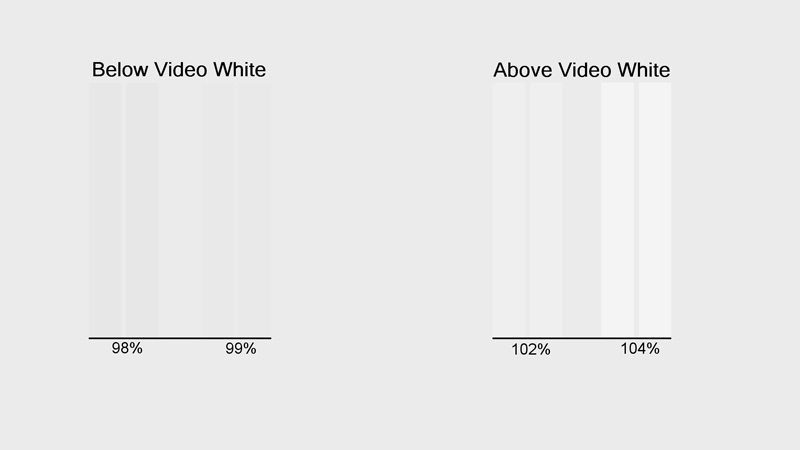 Under no circumstances should the "Below Video White" bars ever be invisible. NOTE: When setting black level we want to ensure that all below-black information is invisible. From this you might think that we should also set white so that all above-white information is also invisible. This is not correct. It is useful to leave some headroom in your display's output that allows for the reproduction of above-white, as some content in this area will occasionally be included. 2.2.2.4. Return to the main ChromaPure window, and click the Raw Data icon under the Tools heading. 2.2.2.5. Display the 100% white test pattern again found on the ChromaPure Calibration Disc at: Main Menu -> Adv. Color Management -> Full Field Amp/100%S (or 6.5% Window Amp/100%S) -> White Sweep -> 100% White. Numeric values will appear in the x, y, and Y area at the top of the screen. For our current purposes, we are only interested in the Y (luminance) value. 2.2.2.7. Adjust the display's contrast control until the meter measures a reference level of output. For front projectors, this is 48 cd/m2 (or 14 ft-L). For flat panel monitors it is 120 cd/m2 (or 35 ft-L). 2.2.2.8. When finished, click Stop. TIP: If you can adjust light out by using a control other than the contrast, then it is always better to use that. For example, many front projectors have a manual iris. LCD displays have a backlight control. Both are particularly useful for adjusting the display's overall light output. 2.2.2.9. Display the Contrast (or white PLUGE) test pattern again found on the ChromaPure Calibration Disc at: Main Menu -> Basic Calibration -> Contrast. Ensure that at the reference output level the display does not clip white. You should still be able to see the "Above Video White" and "Below Video White" bars. If the reference level does cause the display to clip, then lower the contrast to the highest point where it does not. Whenever there is a conflict between achieving reference light output and white clipping, always select the setting that avoids white clipping. 2.2.2.10. Return to the main ChromaPure window, and click the White Balance icon under the Calibration heading. 2.2.2.11. Display the 100% white test pattern again found on the ChromaPure Calibration Disc at: Main Menu -> Adv. Color Management -> Full Field Amp/100%S (or 6.5% Window Amp/100%S) -> White Sweep -> 100% White. 2.2.2.13. Adjust the display's RGB HighEnd controls to get an equal balance of RGB. The ΔE number (deltaE or dE) should be 2.0 or less. If you are unable to achieve good white balance at the current setting, you may have to lower the contrast control. The proper tradeoff between overall light output and good white balance is largely a matter of personal preference. 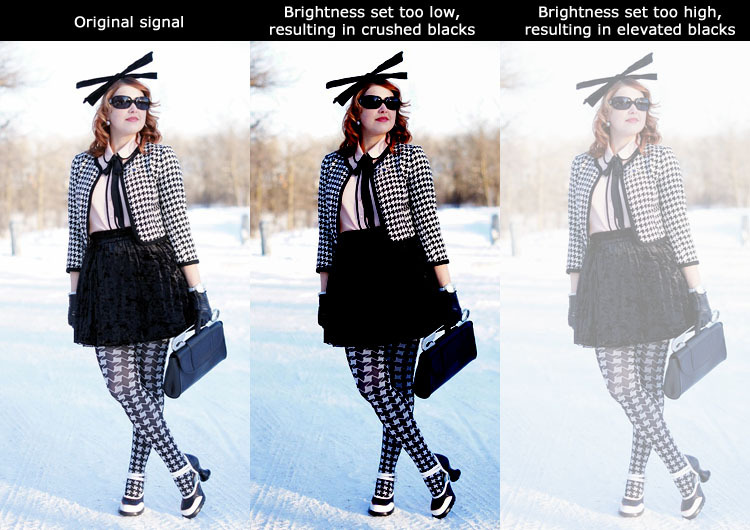 However, it is probably better to raise the acceptable white balance error a little in order to maintain adequate light output (per the recommendations above in section 2.2.2.7). You should not allow the ΔE to rise above 4.0. Show no sign of clipping or white crush. Exhibit the reference light output at 100%. Exhibit good white balance at 100%. Remember, you can always compromise somewhat on light output and white balance, but you should never overdrive the display and allow it to clip white. To set the sharpness control correctly, the goal is to maximize the real detail produced by the display without producing artifacts that actually reduce image fidelity. 2.3.2. Stand very close to the display so you can see the test pattern very clearly. 2.3.3. Set the display's sharpness setting at the highest level possible without it causing visible outlines or halos along the edges of the horizontal and vertical test pattern lines. Often this involves turning the sharpness control down substantially or completely off. 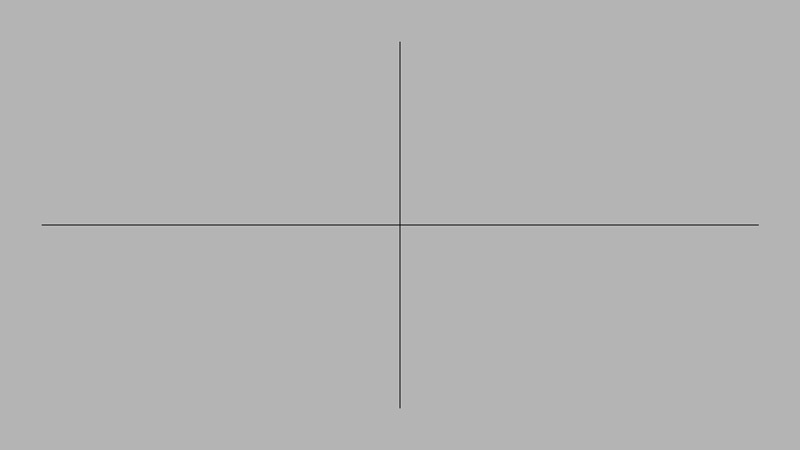 Now that the levels are set properly, you can proceed to calibrating the grayscale. Ensure that ChromaPure is running and your sensor initialized. 2.4.1. Return to the main ChromaPure window, and click the White Balance icon under the Calibration heading. 2.4.3. Display the 80% test pattern found on the ChromaPure Calibration Disc at: Main Menu -> White Balance -> Full Field (or 6.5% Window) -> 80%. Click C (Continuous). The real-time white balance information for the 80% point will appear. 2.4.4. Make adjustments to your display's RGB HighEnd control until the RGB values displayed in the White Balance module are nearly equal and the ΔE is below 2.0. 2.4.5. When you have achieved good results at 80%, display the 20% test pattern and repeat the process again, this time adjusting your display's RGB LowEnd control. The 20% pattern can be found on the ChromaPure Calibration Disc at: Main Menu -> White Balance -> Full Field (or 6.5% Window) -> 20% or by simply skipping to the next chapter. NOTE: When making adjustments to the RGB HighEnd and RGB LowEnd controls on your display during grayscale calibration, it is always best to adjust red and blue only. Leave the green control at its default. 2.4.6. Go back-and-forth between 20% and 80% until both levels show good RGB balance and the ΔE is below 2.0. It may require several sets of measurements. Skipping to the next chapter in the ChromaPure Calibration Disc will toggle between 80% and 20% in an endless loop. TIP: Some displays will offer the ability to adjust grayscale at 10 points, instead of simply the standard RGB HighEnd and RGB LowEnd. If you have such a display, we recommend adjusting back and forth at the 80% and 20% points as described here as it'll likely give you 90% of what you need. Then use the 10-point system for minor touch-ups only at the specific problem points (i.e. If after doing a full sweep as mentioned below in 2.4.8 it is determined that the 10% point is off, put up a 10% test pattern and adjust the point that corresponds to 10% in the display). 2.4.7. Return to the main ChromaPure window, and click the Grayscale icon under the Post-Calibration heading. 2.4.8. Take a full set of measurements just as you did in the Pre-Calibration Grayscale module. 2.4.9. The errors (ΔE) are shown as CIE94 in the image above. If all are below 2.0 then you are done. If they are not, then make the necessary spot adjustments to reduce the errors as much as possible. Unlike grayscale or even color calibration, gamma calibration is often hampered by the lack of controls. Most display manufacturers do not offer dedicated gamma calibration controls. A particular gamma curve is generally associated with each of the various Picture modes on the display. Also, some displays will offer a selection of gamma presets. A few displays offer full-featured 10-point gamma controls. Some external video processors such as the Lumagen Radiance series offer 10-20 points or more. TIP: What Gamma Curve Do I Aim For? 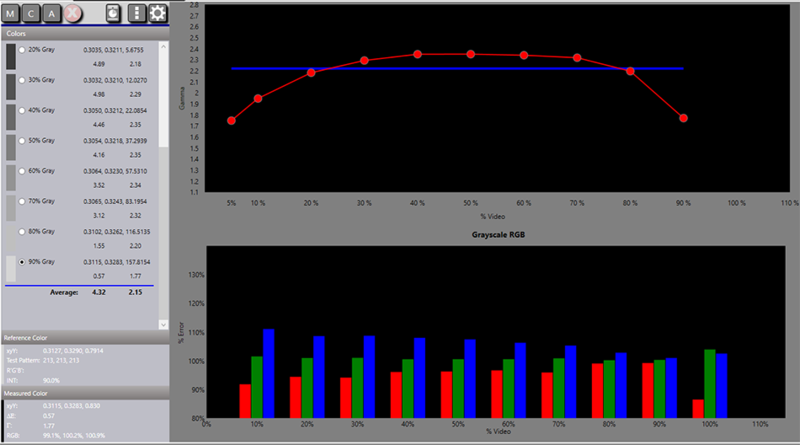 The gamma curve that the vast majority of users should aim for will measure about 2.3 from 40%-90% video. Below 40-90% video the amount of gamma correction should progressively increase, producing a gamma of about 2.1 at 10%. (The lower the gamma correction value, the more gamma correction that is applied). This gamma curve will produce excellent results for both high-contrast projectors in dark home theaters and flat panel displays in well-lit living rooms. If your display has only Picture modes with different gammas or a few gamma presets to choose from, select the one that is closest to an average of 2.22. If you display or video processor (such as the Lumagen Radiance) offers a 10-point (or more) gamma control, then create the curve described above. The following instructions assume that you have a complete 10-point gamma control. 2.5.1. Return to the main ChromaPure window, and click the Gamma icon under the Calibration heading. 2.5.2. Display the 100% white test pattern found on the ChromaPure Calibration Disc at: Main Menu -> Gamma -> Full Field (or 6.5% Window) -> 100% Stimulus. Click M (Measure). ChromaPure will automatically advance to 90%, ready for the next reading. 2.5.3. Advance to the 90% white test pattern and click M (Measure) again. 2.5.4. Repeat this process until you have measured down to 5%. This provides the baseline measurements. TIP: If your display or video processor offers the option for adjusting gamma at 5%, then extending the calibration down to this level will ensure optimized shadow detail. Otherwise stop at 10%. If your display or video processor does not offer full-featured 10-point (or more) gamma controls, you may need to try different gamma values and chose the one that best matches the target in the 40%-90% range as mentioned previously. You would then skip steps 2.5.5 - 2.5.9. 2.5.5. Display the 90% white test pattern found on the ChromaPure Calibration Disc at: Main Menu -> Gamma -> Full Field (or 6.5% Window) -> 90% Stimulus. Click 90% and then click C (Continuous). 2.5.6. Raise or lower gamma as needed on your display to move the red circle at 90% to the blue line. NOTE: Gamma and luminance moves in opposite directions. As luminance is raised, gamma goes down. As luminance is lowered, gamma goes up. 2.5.7. When the gamma target is reached, click Stop. 2.5.8. Repeat this process at each point until the measured value meets the gamma target at each level. 2.5.9. Since gamma calibration and grayscale calibration are interactive, you will almost certainly have to touch-up the grayscale (STEP 2.4) once you have finished with gamma. Fortunately, changes in gamma have a much larger affect on the grayscale than changes in grayscale have on gamma. Thus, after the grayscale touch-up it will usually not be necessary to make further changes to gamma. Once video levels, grayscale, and gamma have been satisfactorily completed, you can move on to color calibration. Before we begin color calibration, let's start with a discussion of some basic concepts and terminology. This graph represents an internationally agreed method of mapping all the colors or "color space" that the human eye can see. It's called the CIE 1931 color space. It was created by the "Commission Internationale de l'Eclairage" or "CIE" (French for "International Commission on Illumination") in 1931. It is generally referred to as a CIE chart. As you can see, the CIE chart renders color on an xy axis. Thus, any color represented in the chart can be specified by a combination of xy coordinates. For example, video white is defined as the point x=0.3127, y=0.329. The only problem with this chart is that it is two dimensional, while color is three dimensional. This chart describes the hue and saturation of a color, but it ignores the third element, which is luminance (light output). This must be represented separately, usually with a bar chart. The points highlighted on the chart mark the references for the primary (red, green, and blue) and secondary (yellow, cyan, and magenta) colors in the HDTV system. The goal of color calibration is to ensure that the display represents these colors accurately, and this can be demonstrated by plotting them on the chart. These are the numbers used internally by ChromaPure to calculate how close your display measures to these known standards. You'll notice that these color specifications include a Y value. This is luminance, the third aspect of color that is not captured by the CIE chart. If these numbers are not xy coordinates on the chart, then what are they? Notice that white is always 1.0. The remaining colors are just a percentage of white. So, using the Rec. 709 red as an example, red is 21.26% as bright at white. So if white measured 120 cd/m2, then red should measure approximately 25.5 cd/m2. With these preliminary concepts out of the way, let's start with the actual calibration. Although color management systems (CMS) are more common today than they used to be, you may still encounter a display without one. In such a case, the options for color calibration are quite limited. In most cases all you will be able to do is adjust the main Color and Hue or Tint controls. 2.6.1.1. Start ChromaPure and initialize the meter (see STEP 1.2). 2.6.1.2. Return to the main ChromaPure window, and click the Color/Tint icon under the Calibration heading. 2.6.1.3. Display the 100% white test pattern found on the ChromaPure Calibration Disc at: Main Menu -> Adv. Color Management -> Full Field Amp/100%S (or 6.5% Window Amp/100%S) -> White Sweep -> 100% White. (For more information on the type of test pattern to display, refer to STEP 1.1: Setting up the Test Pattern Source). ChromaPure will advance to the red color. 2.6.1.5. Display the 75% red test pattern found on the ChromaPure Calibration Disc at: Main Menu -> Adv. Color Management -> Full Field Amp/100%S (or 6.5% Window Amp/100%S) -> Red Sweep -> 75% Red. Click M (Measure) again. Repeat this process until you have measured all of the primary and secondary colors. 2.6.1.6. Select the Red radio button. 2.6.1.7. Display the 75% red test pattern again found on the ChromaPure Calibration Disc at: Main Menu -> Adv. Color Management -> Full Field Amp/100%S (or 6.5% Window Amp/100%S) -> Red Sweep -> 75% Red. Click C (Continuous). ChromaPure will display the error value in real time as you make adjustments. 2.6.1.8. Adjust the display's main color control on the display until you have minimized the red error for red, green, and blue. The human eye is especially sensitive to red errors, so it is best to concentrate on this. 2.6.1.9. When finished, click Stop. 2.6.1.10. Select the Magenta radio button. 2.6.1.11. Display the 75% magenta test pattern found on the ChromaPure Calibration Disc at: Main Menu -> Adv. Color Management -> Full Field Amp/100%S (or 6.5% Window Amp/100%S) -> Magenta Sweep -> 75% Magenta. Click C (Continuous). 2.6.1.12. Adjust the display's main Hue or Tint control until you have minimized the error for magenta. 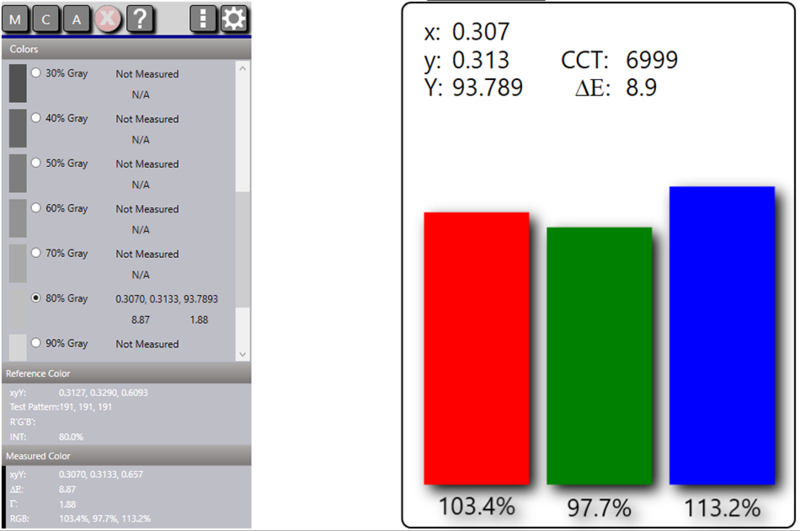 If you have a display with a CMS you will be able to adjust color performance with much greater control and precision. TIP: Even if your displays lacks a CMS, you can always purchase an external video processor such as the Lumagen Radiance to add CMS capability to any display. Devices such as these placed in the signal path before the display provides a full range of grayscale, gamma, and color correction tools. 2.6.2.1. Return to the main ChromaPure window, and click the Color Mgmt icon under the Calibration heading. 2.6.2.2. In the application Options panel ensure that you have selected the desired Reference Gamut. In most cases, you will want to use the default, Rec. 709, the HDTV standard. 2.6.2.3. Select the desired Color Space. 2.6.2.4. Select whichever color space matches the controls in your display or processor's CMS. For example, Samsung flat panels and Lumagen processors use RGB. The DVDO Duo uses xyY. Most other CMS's use HSL (Panasonic plasmas and JVC, Epson, and Sony projectors). 2.6.2.5. Display the 100% white test pattern found on the ChromaPure Calibration Disc at: Main Menu -> Adv. Color Management -> Full Field Amp/100%S (or 6.5% Window Amp/100%S) -> White Sweep -> 100% White. Click M (Measure). 2.6.2.6. Repeat this process until you have measured white and all of the primary (red, green, blue) and secondary (yellow, cyan, magenta) colors using the patterns found on the ChromaPure Calibration Disc at: Main Menu -> Adv. 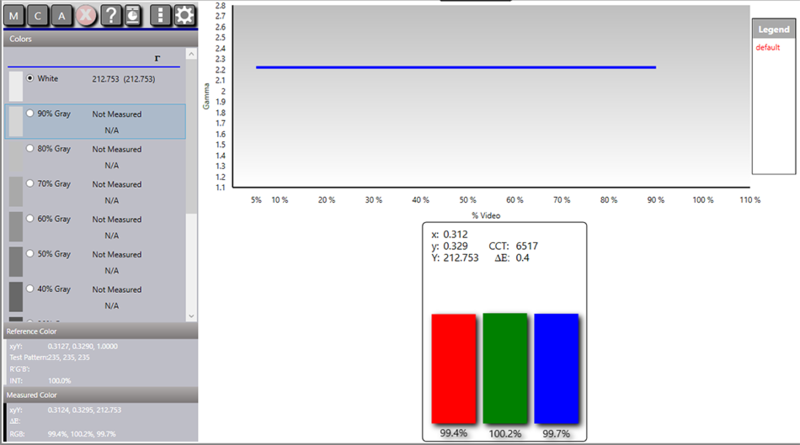 Color Management -> Full Field Amp/100%S (or 6.5% Window Amp/100%S) -> Red, Green, or Blue Sweep -> 75%. 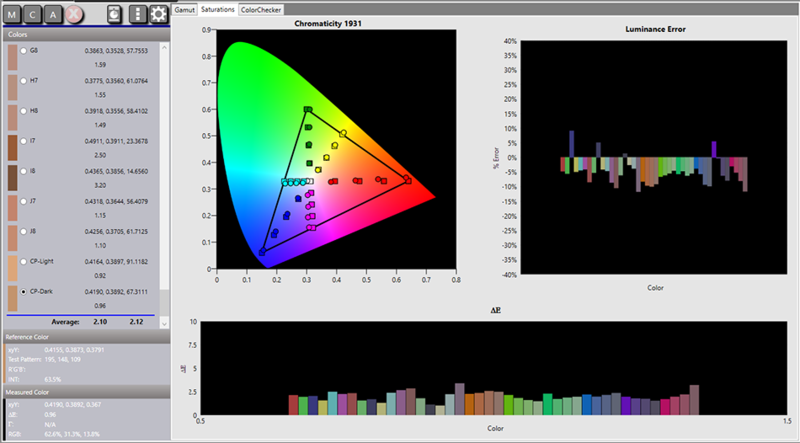 This provides a pre-calibration snapshot of your display's color performance and should look similar to what you measured in the Pre-calibration Color Gamut. 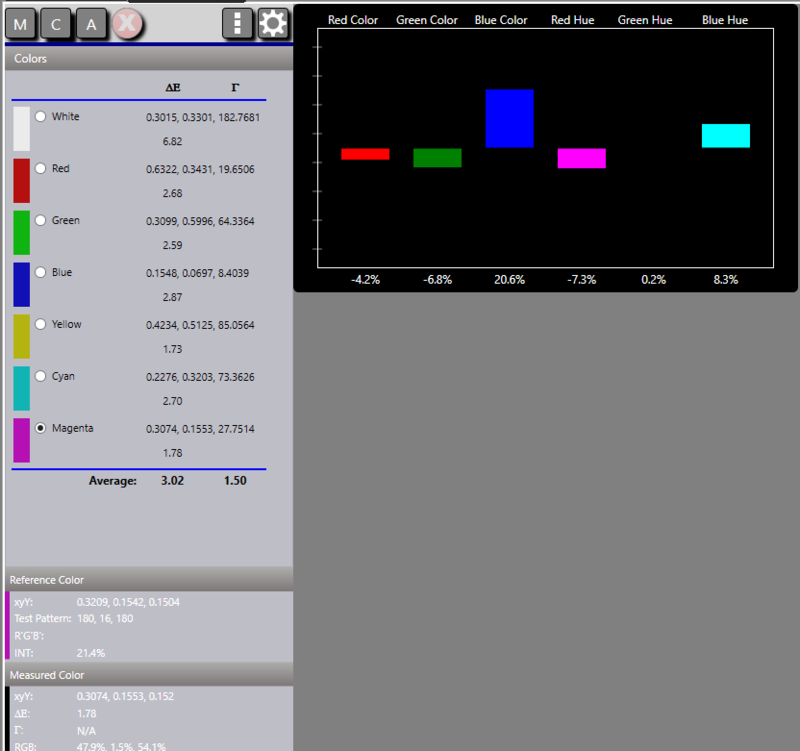 The Color Management module will display raw data, the CIE chart, and display errors in the bar chart. 2.6.2.7. Click the Red color selector and display the 75% red test pattern found on the ChromaPure Calibration Disc at: Main Menu -> Adv. Color Management -> Full Field Amp/100%S (or 6.5% Window Amp/100%S) -> Red Sweep -> 75% Red. Click C (Continuous). 2.6.2.8. Using your display or processor's CMS, make the necessary adjustments to lower the color error to an acceptable level. Look at the bar chart, which will display errors in the three axes of color performance. As you make corrections using the CMS, these values will change in real time. The goal is to get each color's ΔE to 1.5 or below. 2.6.2.9. When you have achieved the desired target, click Stop. TIP: You may find that the three axes of adjustment interact. This is often especially true with Lightness and Saturation in the HSL color space. This is fine. Just go back-and-forth between them until both show acceptable errors. 2.6.2.10. When you have finished correcting all of the colors, in Module Options, click Erase all data from this module. 2.6.2.11. Measure white and all primary and secondary colors again (steps 2.6.2.5 to 2.6.2.10) to verify that you have satisfactorily removed all of the serious color errors. Perform spot corrections if necessary. Once you have finished all of the calibration procedures, it is time to check your work. 3.1.1. Return to the main ChromaPure window, and click the Grayscale icon under the Post-Calibration heading. The Post-Calibration Grayscale module will appear. 3.1.2. Take a full suite of measurements as you did when running the Pre-Calibration Grayscale module (see STEP 1.3.1). 3.1.3. If everything looks good, then you are finished with grayscale and gamma. If not, then make small spot corrections as needed. 3.1.4. Return to the main ChromaPure window, and click the Color Gamut icon under the Post-Calibration heading. 3.1.5. 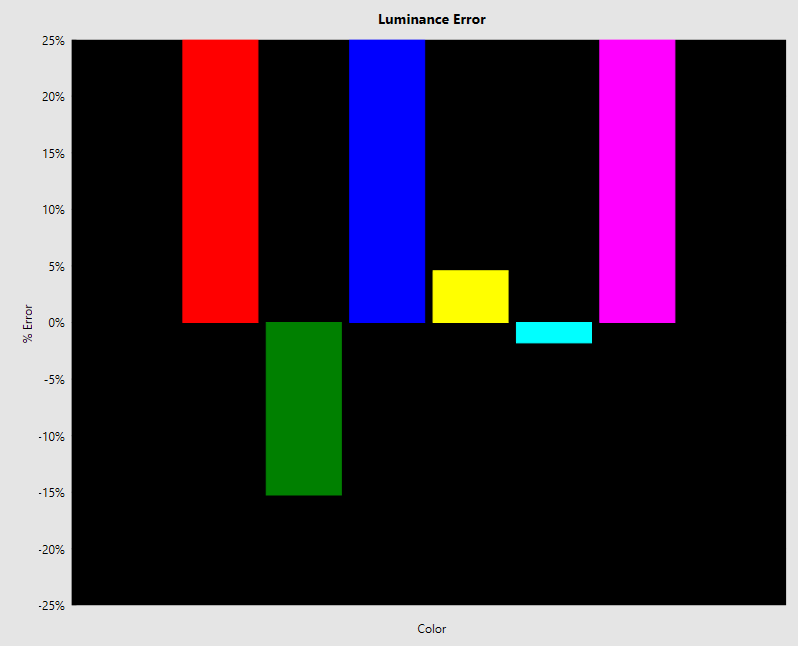 Take a full suite of measurements as you did running the Pre-calibration Color Gamut module (see STEP 1.3.4). 3.1.6. If everything looks good, then you are finished. If not, then make spot corrections as needed. When you are fully satisfied with your efforts, you may want to run a calibration report to save for your own records or to share with others. 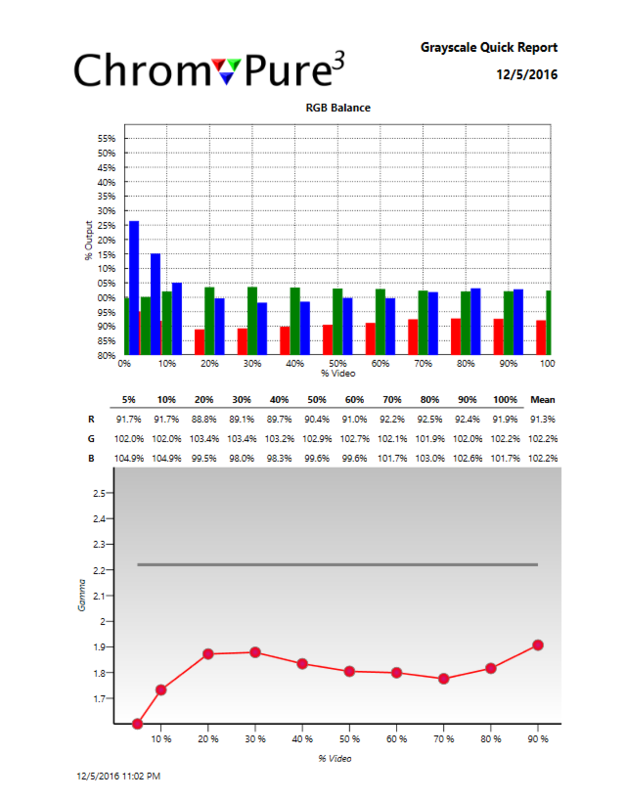 ChromaPure includes three ways to generate calibration reports. 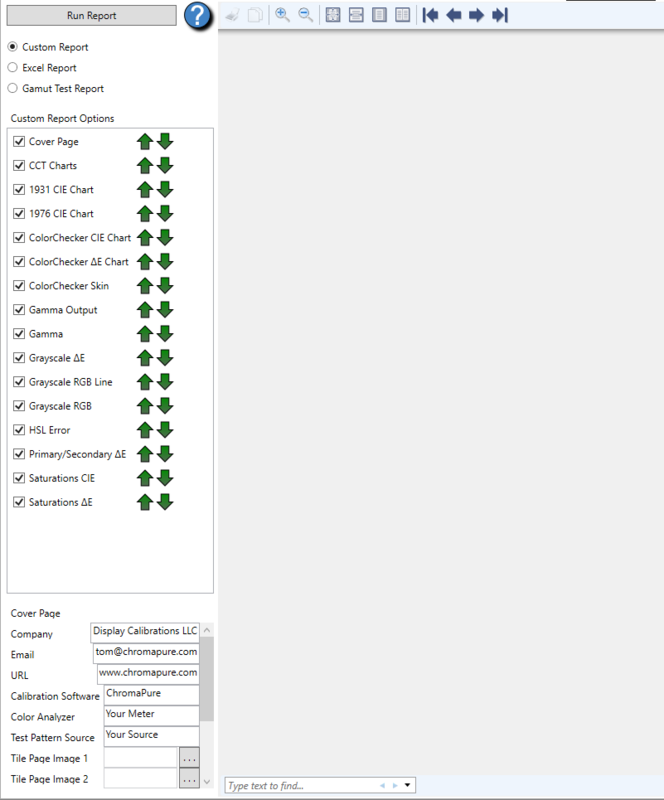 Quick Reports are available in many of the ChromaPure modules. They basically reproduce the information shown in the module they are generated from. 3.2.1.1. To run the report, simply click the Quick Report icon ( ). 3.2.1.2. To save the report, simply click the Print icon on the toolbar and select either the XPR printer or a PDF printer. If you don't have a PDF printer installed, you can download a free one from the Internet (there are several). Either XPS or PDF can be easily shared on the web and free viewers are available. 3.2.2.1. Return to the main ChromaPure window, and click the Reports icon under the Post-Calibration heading. 3.2.2.2. Select Detailed Calibration Report or Excel Report. TIP: If you run an Excel report, you must have Microsoft Excel 97 or later installed. Also, ensure that Excel is closed when you run the report. NOTE: You can select which report pages will appear and the order in which they will appear on the left of the screen. You can also specify the information that will appear on the cover page. A comprehensive calibration report will appear. 3.2.2.4. To save the report, print to XPS or PDF as described above. As of the Microsoft Office 2007 SP2 release, save to PDF is built-in to Excel. Also, a Microsoft PDF printer is built-in to Windows 10. 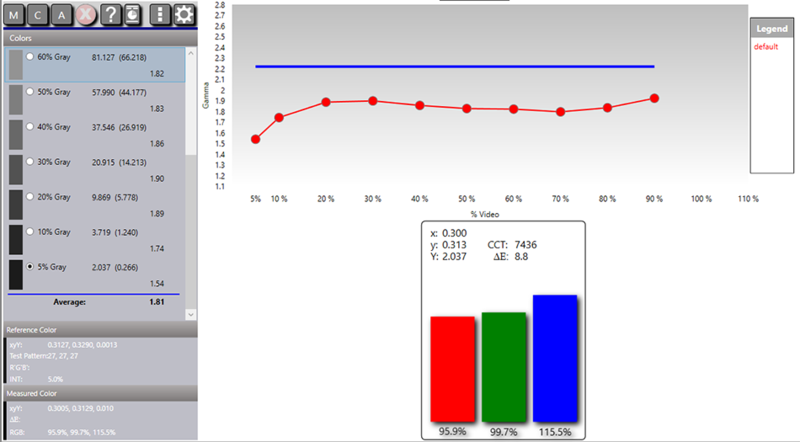 In addition to running reports, you can also export ChromaPure calibration data. You save the data in CSV format. You can also save a session file (*.calx) that only be subsequently loaded into ChromaPure. 3.3.1. To save module data in CSV format, click the Module Options button ( ) within the desired module and select Export Measurements. A standard Windows Save As dialog will appear. 3.3.2. In the Save as Type drop-down, select CSV (comma separated value). CSV data can be opened for analysis in Excel or other CSV compatible software. 3.3.3. To save a ChromaPure session file (*.calx), return to the main ChromaPure window, and click the Save Session icon under the Tools heading. 3.3.4. To load a ChromaPure session file (*.calx), return to the main ChromaPure window, and click the Load Session icon under the Tools heading and browse to where the .calx file was saved. The new 4K UHD TVs and Blu-ray discs present a special set of challenges for calibration. The biggest problem is that no commercial display can render the dynamic range required by HDR or the full color gamut required by the Rec. 2020 gamut. All UHD Blu-ray discs include both HDR and Rec. 2020. Another issue that that in order for the display to enter the proper HDR mode the user must employ specialized test patterns. The ChromaPure calibration disc will not work for this purpose. As of this writing (early 2017) there is only one set of affordable HDR test patterns available. They can be purchased here. 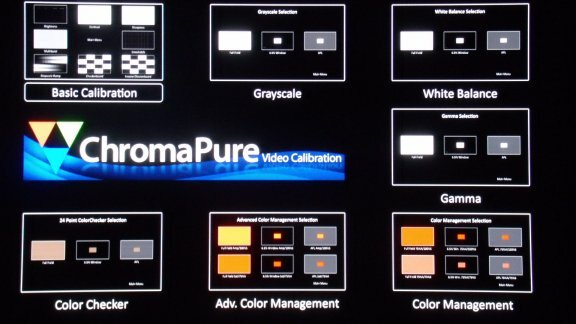 Once you have the HDR test patterns and an HDR display, you can use ChromaPure to calibrate the display in HDR mode (4K HDR mode and 2K HD require independent calibrations). On the Initial Setup page, select 50% for Color Intensity. In the Options module under the Gamut tab, select Rec. 2020 as the Reference Gamut. Also, under the Gamma tab, select HDR10 as the Gamma Target. Once you have made these selections, close the Options module. Open the Gamma module and calibrate gamma just as you did with a standard 2K HD display, except you won't be able to adjust the display's gamma above 60-75% video. Current displays simply do not support dynamic range above that. Open the Color Management module. In Module Options select 50% saturation and then click Apply. Calibrate to the 50% saturation target for the Rec. 2020 reference gamut just like you would using different targets for a standard 2K HD display. White Balance / grayscale calibration is no different in HDR mode. I hope that this guide has helped you understand why proper calibration is one of the most important enhancements that should be performed on all TVs or projectors for optimal picture quality. Directors, cinematographers, and motion picture colorists go to great lengths to ensure that the content you watch is reproduced with accurate colors. By doing your part and calibrating your display, you help ensure that what you see at home is a perfect match to what these professionals intended for you to see. Enjoy your newly calibrated display! I’ve just received by replacement tv (E701i-A3) from Vizio. It has a new added feature (CMS). Under this menu it provides for an 11pt greyscale calibration. It starts at 5% and then goes to 100% by 10’s. For each point there is an adjustment for red, green and blue. Under this menu there is also a color tuner. This has red, green, blue, cyan, magenta and yellow. Each color has settings for hue, saturation and brightness. The red, green and blue have an additional adjustment for offset and gain. If I were doing a 2pt greyscale calibration I guess I would use just the color tune and the gain and offset. However if I use the 11pt option do I need to use the offset and gain found under the color tuner? If you're doing a greyscale calibration you need to use the R/G/B for greyscale, likely not controls in any color menus as that is probably part of the CMS. I really depends on the manufacturer and how they have laid things out however. If I understand correctly you're asking how the specific controls in your TV work and what they actually do. Every manufacturer offers different controls so you need to work with your display and figure out what each of the controls actually control and go from there. Unfortunately there are quite literally 100's of TV manufacturers all with different controls. We cannot offer detailed instructions for each TV model, nor do we have an in-depth understanding of each of the 100's of models that exist. Thank you for the quick reply. I guess I'm wondering what the "offset" and "gain" are for which is under the "color tuner" and apply to the red green blue only. I realize this may be outside your ability as there aren't any real naming conventions or the like. If you have any guesses please feel free to elaborate. I don't know Don. As you mention every manufacturer seems to do things differently. That would be a question for them. Write down the initial values and try them. If you have questions on how to calibrate your specific display, I would start a new thread about it and others can chime in. I have two more questions and then I'm ready to use your greyscale&Color calibration for dummies. 1. My set has the offset and gain for a 2 pt cal and also a 11pt way to do it. Do I do the 2 pt then a 11pt or go straight to the 11pt. 2. My set is an edge lit LED. Do I use full screen or window for greyscale and color? btw I'm using you old ver because I have the old eye one and all the software loaded. Nice piece of work you did. Do 2 point and then use 11 as required to get things more accurate. Doesn't matter if you use window or full screen on your display. Both will work. It's only CRT and Plasma that must use window. Good luck! Kal, thanks for producing a 2nd edition of the guide. I notice that the new guide omits the section on Chroma Meter orientation. I'd like to see this section included at the end of the Introduction, after introducing the equipment that will be required. The words are there, but I think the pictures that were in the original guide did a better job of explaining where the meter should go. The pictures provided that extra degree of clarity. Understood. I never took a picture of it. If you want to be sure, play with the angle until you maximize the light output reading. 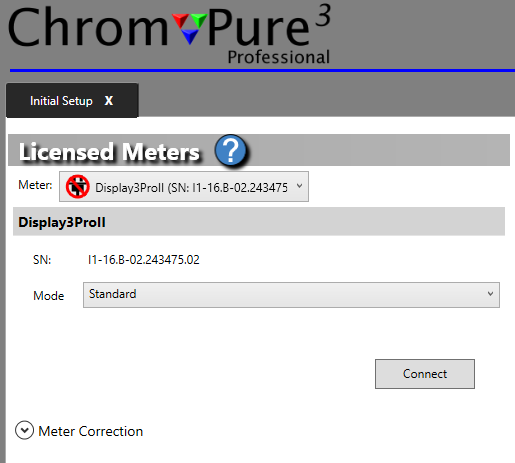 I have just purchased a license for Chromapure and now I would like to use it for calibrating my LED TV Sony KDL-46HX855. Maybe it would be more appropriate in my case to speak about "attempting to improve the quality of the image" instead of "calibrating". I wondering if with the screen technology of this TV (i.e. LED TV with front gorilla glass) it would be better to place the meter directly in contact with the screen or place it on a tripod back some inches or a foot from the screen. I should be grateful if someone may advise on this regard. With LCD you can place it directly against the screen. I read the outstanding guide and during the past week-end I experienced my first TV calibration. Now I would like to perform one for SD TV channel. Is there any specific advice / Chromapure setting to be applied for this calibration? Regarding the usage of the Chromapure internal test patterns. I can read in the guide that you recommend to use 75% setting for Signal Intensity: what is the impact on the calibration using 100% intensity? SDTV (Rec 601) gamut targets are slightly different than HDTV (Rec 701). See section 2.6. For what it's worth I don't find it worth having two sets of settings (one for each gamut). I calibrate for my best source (HDTV) using the Rec701 gamut as the target as I don't want to have to switch back and forth between the two as I switch between watching DVD and Blu-ray or SD satellite vs HD satellite. The difference is minimal and SD looks pretty sad to begin with so what's the point? Not sure - that's Tom's suggestion (ChromaPure author). Probably to avoid measurement errors if the display clips or crush the signal (or only one of the R/G/B channels) when pushed to 100% intensity. You don't want to push the display outside the bounds of what it can display. For some display types blue will drop off first causing inaccurate results. Most people do not use the ChromaPure internal test patterns as their PC or laptop is not the source - it's always best to use your actual source (ex: Blu-ray player) as the source device. This usually means using a test disc like the one recommended in the guide. This way you've got all of the equipment in the loop. A pro may use a high end pattern generator simply because he knows what to expect (and it can be faster) but he will (or should) always verify the results later using the client's actual source too. Thanks a lot Kal for the clarifications. I am novice in this matter so my questions may be not so meaningful consdering that I am approching this experince for the first time! Were saying going up (higher) 2.3 2.4 2.4 is a lower darker gamma, and going down (lower) 2.2 2.1 2.0 is a higher brighter gamma? I think you forgot to mention the "Video EQ Pro" which is currently selling for $499. It may not do up-scaling, ( I don't care) but what it does it does well.